I looked the four teenage boys straight in the eyes and they looked right back at me—friendly and accepting. I realized I had just made a connection and was amazed at how easy it was. The boys were ready to hear what I had to say, ready to share their own thoughts. We were in a cold, cement block church just south of the U.S.-Mexico border. It was December and there was no heat. A small gasoline-powered generator running outside the building provided the only electricity. Hazy winter sunlight streamed through the large glass windows but didn’t provide much heat or warmth to the room. Between 50 and 60 men, women, and children were sitting on hard metal chairs anticipating our visit. After our program of talking about the meaning of Christmas and handing out shoeboxes filled with gifts to the children, our missionaries sat and talked with whomever was nearby. When I approached the boys, I thought there was little chance a group of teenagers would care to interact with a 30-something foreign man. Experience has taught me that guys in groups aren’t always receptive. I started talking to just one of the boys, and the other three immediately became quiet and started listening. We exchanged names and small talk. The one closest to me spoke English well; he had been born in the U.S. I felt no need to preach, no need to ask probing questions about their spiritual lives; I only wanted to relate to them. And we did, just hanging out together in the church. I don’t know why, but I was surprised at the openness. Maybe this “being missional” stuff isn’t so hard after all. 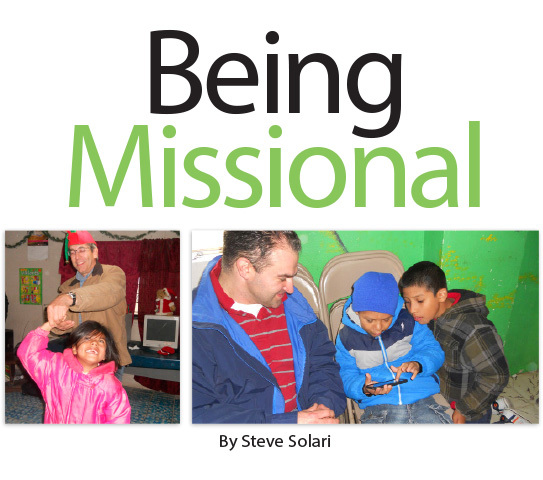 What do I mean by the term “missional”? It’s a commonly-used and perhaps commonly-misused term. I now define being on mission as “allowing Jesus to cross a boundary through me.” That boundary could be geographical, political, cultural, linguistic, generational, educational, or any other kind that separates two people in some way. Sharing the gospel in a country where English is not the primary language would be missional because a linguistic or cultural boundary is crossed. But a woman who shares Jesus with her grandchild while baking cookies together in the kitchen is also on mission, since a generational boundary has been crossed. I believe we ought to re-think what being on mission means, and realize it can be done anywhere, any time. I hope I’ll get the chance to see those boys again next time we visit Pastor Pedro’s church in Mexico. If I do, I may be able to add discipleship as part of my being missional. Sadly, we can sometimes think discipleship is something that happens in a class before or after church. Having a “discipleship class” is a common practice in many congregations, and it’s a wonderful thing. But the term itself can be over-stretched to be synonymous with the term “Bible Study.” In the context of being on mission, though, we are talking about the Great Commission (note the word “mission” in commission) of making disciples. Not just being better disciples ourselves. How do we make someone into a student of Jesus? Just like being on mission, it’s more something Jesus does through us than something we do ourselves—so that removes a lot of pressure. The more important idea is the setting of where it takes place. The most effective disciple-making takes place in the context of relationship. For example, if I had walked up to those boys and said I know exactly what you should do with your lives, why should they believe me? They had no idea of my background or education or motives, and (given the setting) would probably assume I was about to give them some kind of religious guilt trip. They had little reason to trust me and didn’t ask for my opinion in the first place. That’s why a relationship must come first. Theodore Roosevelt famously said, “Nobody cares how much you know, until they know how much you care.” Think about the opinions you seek out regularly. My guess is you seek the thoughts of those you trust and have spent time with over the preceding months or years. Not someone you just met. So my first goal was to establish friendship with the boys. Then, if we meet again, we can build on the relationship. It is there that Christ can be shared most effectively. It is there where the One who is most important to me can be properly shared with someone I care about. One of the misconceptions about being missional is thinking the person’s salvation or relationship with Christ depends on that one encounter. That’s leaving Christ out of the mix—assuming he hasn’t already been working in a person’s life and won’t continue working after I’m out of the picture. I can imagine the next time I’m with the four boys we will talk more about school, jobs, career aspirations, and maybe even girls they have their eyes on. They might ask what it’s like to be married or how I ended up with my job. Then, as part of the conversation, I can bring up the values I’ve learned from Jesus and how much better everything in my life is because of him. And before you know it, the conversation goes much deeper than it ever could have gotten with a stranger. That’s where discipleship really starts to flourish. 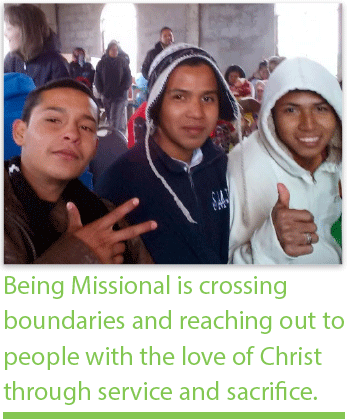 Another way to support discipleship efforts like this is by being incarnational. In this case, I define incarnational as “letting Jesus serve through you.” We had already handed out gifts and food, which involved some personal sacrifice from our team and our hundreds of supporters around the country. But more importantly, we showed how much Jesus loves them by giving up our creature comforts and going to Mexico to spend time with them. To listen, to laugh, to cry and to pray with them. When we sacrifice for someone else, a bond is created that goes beyond money or words. It’s spiritual, and we should never doubt for a second that it creates a doorway for a relationship and then discipleship. Being missional is crossing boundaries and stretching outside the comfort of our own homes and churches. It is seeking to foster deeper relationships with people in order to share Jesus with them and show how much he cares about everything in our lives. It is reaching out to those people with the love of Christ through service and sacrifice. Jesus crossed the boundary of heaven to be with us and live as one of us. He discipled us and set a process of sharing the good news that would last for millennia. He sacrificed for us, to show how much he loves us all. And when he was done, he pointed to his own example, and told us to do the same. Will we?